This website was created in 2004. It features photos, some information, and a lot of links to other websites that feature the same content as this one: stuff about Asian ball-jointed dolls. In other words, this is a website focusing on one aspect of one of my many nerdy hobbies! 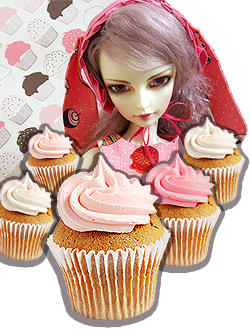 I put some time and effort into making this layout all pink and cute and cupcakey back in 2008(? ), so deal with it. For a while, at least. I have some vague plan to update the design and layout because this site (and my seldom-updated blog) are places where I test out new techniques to use at my day job. 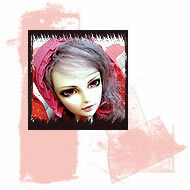 The bonus is being able to grab links to photos of my dolls that I can share with other doll nerds online. Last updated on 3/23/2016: Got around to adding Pluto to Profiles and Photos. Added info on new doll coming shortly. Previous update, 11/07/2015: Did some cleaning up. Edits to About, Links, Photos, and wishlist. Gallery moved to different software dealio. Created iOS-friendly versions of .swf content. I also made a small update to this page. It was a new technique in 2008 and I totally used it in 2015. Previously update, 10/25/2015: Added info, removed bad links (which is to say most/all of them).